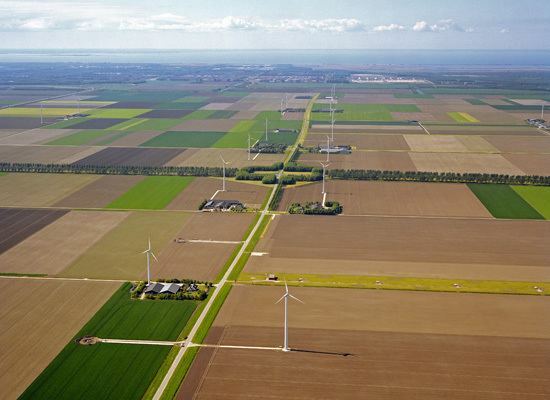 Flevoland ( [ˈfleːvoːˌlɑnt]) is the twelfth province of the Netherlands. It is located in the centre of the country, where the former Zuiderzee was. Flevoland was established on 1 January 1986, when the southern and eastern Flevopolders were merged into one province. Almost all of the land belonging to the province was reclaimed only in the 1950s and 1960s. The province has about 407,905 inhabitants (2016) and consists of 6 municipalities. Its capital is Lelystad. After a flood in 1916, it was decided that the Zuiderzee, an inland sea within the Netherlands, would be enclosed and reclaimed: the Zuiderzee Works started. Other sources indicate other times and reasons, but also agree that in 1932, the Afsluitdijk was completed, which closed off the sea completely. 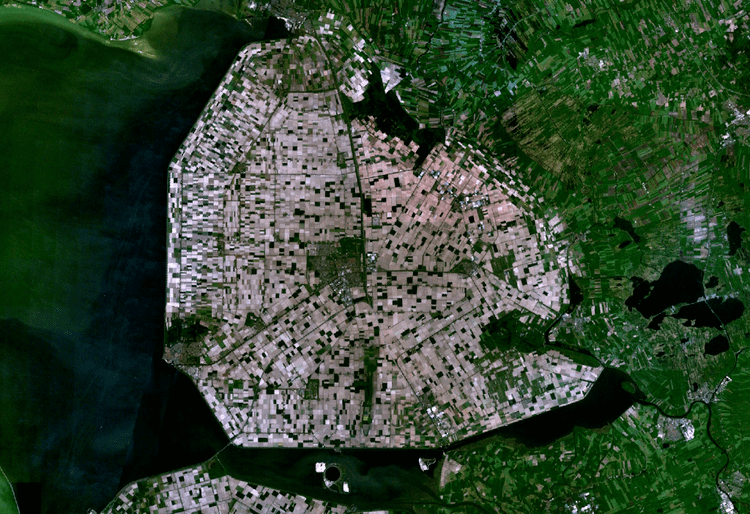 The Zuiderzee was subsequently called IJsselmeer (lake at the end of the river IJssel). 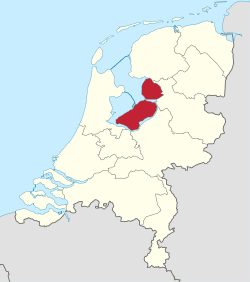 The first part of the new lake that was reclaimed was the Noordoostpolder (Northeast polder) in 1939. This new land included the former islands of Urk and Schokland and it was included in the province of Overijssel. After this, other parts were reclaimed: the Southeastern part in 1957 and the Southwestern part in 1968. There was an important change in these post-war projects from the earlier Noordoostpolder reclamation: a narrow body of water was preserved along the old coast to stabilise the water table and to prevent coastal towns from losing their access to the sea. Thus Flevopolder became an artificial island joined to the mainland by bridges. The municipalities on the three parts voted to become a separate province, which happened in 1986. Flevoland was named after Lacus Flevo, a name recorded in Roman sources for a large inland lake at the southern end of the later-formed Zuiderzee. Draining the Flevoland polders revealed many wrecks of aircraft that had crashed into the IJsselmeer during World War II, and also fossils of Pleistocene mammals. 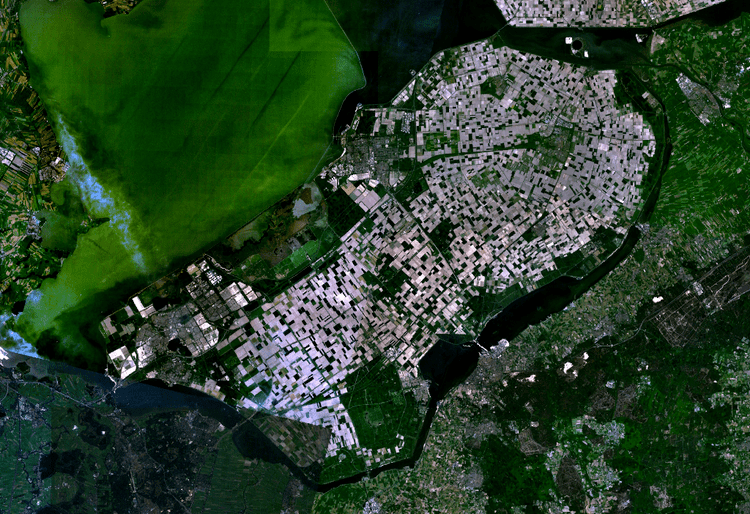 They are two polders with a joint hydrological infrastructure, with a dividing dike in the middle, the Knardijk, that will keep one polder safe if the other is flooded. The two main drainage canals that traverse the dike can be closed by floodgates in such an event. The pumping stations are the Wortman (diesel powered) at Lelystad-Haven, the Lovink near Harderwijk on the mainland and the Colijn (both electrically powered) along the northern dike beside the Ketelmeer. A new element in the design of Eastern Flevoland is the larger city Lelystad (1966), named after Cornelis Lely, the man who had played a crucial role in designing and realising the Zuiderzee Works. Other more conventional settlements already existed by then; Dronten, the major local town, was founded in 1962, followed by two smaller satellite villages, Swifterbant and Biddinghuizen, in 1963. These three were incorporated in the new municipality of Dronten on 1 January 1972. The centre of the polder most closely resembles the pre-war polders in that it is almost exclusively agricultural. In contrast, the southeastern part is dominated by extensive forests. Here is also found the only other settlement of the polder, Zeewolde (1984), again a more conventional town acting as the local centre. Zeewolde became a municipality at the same time as Almere on 1 January 1984, which in the case of Zeewolde meant that the municipality existed before the town itself, with only farms in the surrounding land to be governed until the town started to grow. The King's Commissioner of Flevoland is Leen Verbeek, who is a member of the Labour Party (Netherlands) (PvDA). The States of Flevoland have 39 seats. Since the 2011 provincial elections, the People's Party for Freedom and Democracy has been the largest party in The States, with 9 seats. The second largest parties are the Labour Party and the Party for Freedom, both with 6 seats. The Flevopolder is served by the Flevolijn, running from Weesp to Lelystad, and the Hanzelijn, continuing from Lelystad towards Zwolle. The two railways stations of the province with intercity services are Almere Centrum and Lelystad Centrum. Furthermore, Lelystad Zuid is a planned railway station between Almere Oostvaarders and Lelystad Centrum. It has been partially constructed preceding the opening of the railway in 1988, but construction has been put on indefinite hold because of slower-than-expected development of the city of Lelystad. Amongst the cities with direct train connections to Flevoland are Amsterdam, Utrecht, The Hague, Zwolle, Groningen, Leeuwarden and Schiphol Airport. There are two airports in the province: Lelystad Airport and Noordoostpolder Airport.